Outfielder Travis Jankowski at bat for the San Antonio Missions. Summary: This was a rough season for the Double-A Missions by every measure, including a league-worst 60-80 overall record. However San Antonio had some quality position players come through, including outfielders Hunter Renfroe and Travis Jankowski, and shortstop Trea Turner, who was a lame duck in the organization when the season began because of his inclusion in the Wil Myers trade. While only one San Antonio pitching staff since the team became a Padres affiliate gave up more than the 614 runs this year’s edition surrendered, the Missions once again had a pair of pitchers who jumped to the Majors, and saw several other big arms who will hope to join them next year. Top Players: After losing most of 2014 to a serious forearm injury after crashing into an outfield wall, Travis Jankowski bounced back with a stellar season that included posting a .395 on-base percentage and 25 steals in San Antonio before joining Team USA for the Pan-Am Games, Triple-A El Paso, and ultimately the big league club for a 34-game audition. While his offense flagged in the Majors, he flashed his plus defense in center field, which could earn him a spot in the starting lineup next year. 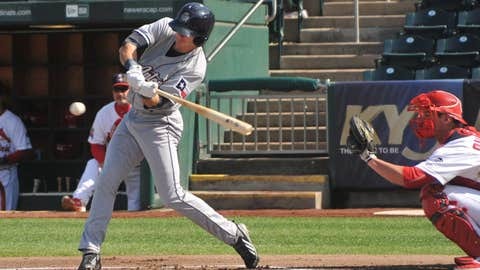 The Missions’ top overall prospect was Hunter Renfroe. Despite a slow first two months, he surged through the season’s second half and capped the year with a stellar three-week run in Triple-A. When he’s on, you get what we saw in June and July — a true power threat who gets on base and who can provide plus defense in the corner. Top Pitchers: While the club as a whole struggled, Colin Rea was dominant en route to claiming our votes as best performer and top prospect. Rea simply outclassed Texas League hitters for the three months he was in San Antonio, posting a 1.08 ERA holding opponents to a .185 average in twelve starts before he got promoted to Triple-A, and ultimately to the Majors. Rea isn’t a future ace in the Majors, but the 25-year-old certainly showed that he belongs as a member of the big league rotation this year. Starter Justin Hancock and hard-throwing reliever Tayron Guerrero were two others whose performances stood out. Sam Geaney, the Padres’ Director of Player Development, talked about how individual and overall club struggles might have helped a few players turn things around in their development this year. Minor League Announcer Series: MadFriars.com talks with the local broadcasters of each affiliate, who see players more than anyone other than the on-field coaching staff, to get their impressions. In addition to the below answers from radio play-by-play man Mike Saeger, we also interviewed announcer Stu Paul, who returned to the Missions’ booth this year for the first time since 2009. Mike Saeger has called 26 seasons of minor league baseball, including seven with the Missions. He grew up playing baseball in the Los Angeles area and played through college as a self-described "good glove/bad hitting catcher." The happily-married father of two girls calls high school football games in the off-season in San Antonio, which for anyone familiar with Texas high school football is a big deal. He gave us his thoughts on the Missions’ season. MadFriars: One of the most important storylines anywhere in the Padres system was the emergence of Travis Jankowski this season. Beyond just being healthy, what did you see different about him this year? Mike Saeger: I didn’t really see anything different since we barely saw him at all last year. It’s hard to really compare the two years since 2014 was such a small sample size. I think he hit better than I expected him to. I figured he’d probably be a .290-type guy this year, for no particular reason. His defense certainly didn’t surprise me. He was a nightly human highlight reel. Got to just about everything that wasn’t hit over the wall. I think he’ll find his way to being a very nice leadoff hitter in San Diego for many years and pitchers will love having him behind them in the outfield. The Padres’ 2013 first-rounder, Hunter Renfroe, got off to a rough start, but then improved every month until a downturn just before his promotion in August. What were the keys to his success and what are the rough areas he’ll still need to work on? Mike Saeger: The staff worked with Hunter a couple months in on quieting down some things related to his load and hitting mechanics. I think that helped get him started. He also became a more disciplined hitter when he got hot. He still swung at some stuff out of the zone but not nearly at as high of a rate as he had been. Obviously, confidence born out of having some success at the plate also went a long way. Shortly before his promotion it seemed like some bad habits started leaking in there again, mostly chasing a lot of stuff out of the zone. Overall, though, nice rebound from a very slow start to the season. I think that moving forward, it’s probably a matter of just continuing to be aggressive in the zone and minimizing the amount of pitches chased outside the zone. All the tangibles are there. He’s got a rocket arm but I think he probably needs to work more on his routes to the ball, which might also have to do with the read of the ball off the bat. One guy who doesn’t have as much name recognition, but who put things together nicely in the second half is Alberth Martinez. As the Padres face a call on whether to protect him on the 40-man roster this winter, what will they have to consider? Mike Saeger: Alberth kind of quietly went out and had a pretty solid season. He didn’t really start to get it rolling until around the third month. I don’t know what the outfield situation will be in San Diego or El Paso next year in terms of depth, so it’s hard for me to say right here and now if he’s a priority to protect on the 40-man. To me, I think Martinez is probably an up-and-down guy. He played a pretty solid outfield for us and has some pop in his bat. He’s not a blazer on the bases, but he’ll draw a couple of walks and doesn’t strike out at an exceedingly high rate. He’s definitely a much better hitter against left-handed pitching than righties (.892 OPS vs. .680 OPS). I’ve really struggled to come up with any sort of comp for Yeison Asencio, who could seemingly stand in the parking lot and still swing at a dozen pitches – and make contact with most of them. Is there anyone who comes to your mind, and what do you make of his offensive profile? Mike Saeger: When you consider how seldom he walks (4.4% career) and how often he swings (always) it’s somewhat impressive that he’s able to hit for the average he has throughout his career. He’d swing at a hotdog wrapper if it flew by but would likely make contact with it. He can take some of the ugliest hacks and yet dunk a single into right or ground one through the hole somewhere. He has good power but it doesn’t consistently translate. His offense is better than his defense in what I’ve seen in his 2 1/2 years here. I think he’ll always hit because he just has a knack for contact. Comparatively as a hitter, he’s kind of a minor league version of Manny Sanguillen or even Vlad Guerrero in that they were two hitters who swung at nearly everything but managed to hit. Through the first three months of the year, Colin Rea was an absolute beast in the rotation. Tell us what made the difference for him in San Antonio. Mike Saeger: Two big things that I think helped Rea turn the corner were pitching more aggressively compared to early in his career and incorporating the splitter as his changeup. He never could get a feel for a traditional change and the splitter really worked well for him and gave him a pitch for lefties. I did see him throw a few innings on TV in the big leagues and he looked like the same guy we saw down here. I think he should have a pretty nice career as a big league starter. He’s a very nice guy, too. I can’t think of another pitcher who has put as many men on base, struck out a relatively low number of hitters and still held opponents’ run totals in check as much as Justin Hancock. What was his go-to to get out of trouble and what does he offer when things are going well for him? Mike Saeger: He’s somewhat of a power sinkerball pitcher — a fastball/slider combo for the most part. His fastball was usually 94-95, so he’s not the power sinker guy in the mold of someone like a Kevin Brown. You would think he should be a little more of a strikeout guy. The key for him was command and minimizing the walks. When he was able to do that he was usually good. He’ll give up some hits but many of them are singles. The opposition slugged less than .400 against him for the season and he allowed homeruns in only 1.5% of plate appearances. Perhaps refining his changeup will help him have a little more success against lefties. His walk rate against lefties was also quite a bit higher. I like him and I’m not sure if he profiles better as a reliever or a back-end starter, but I think he’ll pitch in the majors. Obviously, Tayron Guerrero’s fastball can be devastating. Overall, he did a better job controlling it this year than in the past, but still went through a few outings when it just wasn’t there for him. Is it just a matter of continuing to hone his consistency for the big man? Mike Saeger: Yeah, I think consistency for a big pitcher is key. He has a lot of moving parts. Just about every bad outing he did have was related to not throwing strikes. He rarely got hit. I think his slider has room for improvement but you have to consider how far he’s come in the last couple of years, taking some big steps already. You can’t teach 100 MPH. He’ll get to the big leagues, but just needs a little more seasoning. Ronald Herrera got knocked around in his first few outings after arriving in San Antonio, but then put up back-to-back dominant outings. As young as he is, it seems like he’s still really coming into his own, even as a guy with some real maturity for his age. What did you make of the 20-year-old righty? Who haven’t I asked you about who I should have? Anyone whose importance to the club might not come through on the stat sheet but really makes a difference when you watch every day? Mike Saeger: The one off-the-radar guy who impressed me the most was Adam Cimber, a submarine righty. For the first couple of months he absolutely couldn’t get lefties out. But through a lot of work with our pitching coach, Jimmy Jones, he started to make adjustments, mainly by being able to pitch in more effectively as opposed to keeping everything off the plate. He really improved dramatically in retiring southpaw hitters, so much so that by the end of the season there was little difference in batting average between the two. In addition, he started seeing more work in high-leverage situations later in the season because he was getting the job done. He intrigues me and I’ll be curious to see if he can continue that success up the ladder. I also liked what I saw from Auston Bousfield. I know he was supposedly gassed when he got here and it took him a little time to get going, but he evidently caught a second wind and had a pretty nice finish to the season. He played a good centerfield and he’s another guy I’m looking forward to watching next year when he starts off fresh from an offseason of rest. Finally, the biggest turnaround and maybe best feel-good story of the year had to have been Luis Domoromo. He was automatic out for about the first 2 1/2 months as he carried one of the three or four lowest Double-A batting averages, OBP, and SLG percentages. But something happened around mid-June and suddenly he became a hitting machine who also started hitting for some power. He tailed off a bit his last couple of weeks before an injury ended his season with maybe a week or so to play, but this is a guy about whom you wondered early on if he’d even have a job in 2016.